There are 8 Assisted Living Facilities in the Abingdon area, with 5 in Abingdon and 3 nearby. The average cost of assisted living in Abingdon is $3,522 per month. This is higher than the national median of $3,346. To help you with your search, browse the 20 reviews below for assisted living facilities in Abingdon. On average, consumers rate assisted living in Abingdon 3.7 out of 5 stars. Better rated regions include Lebanon with an average rating of 4.0 out of 5 stars. Caring.com has helped thousands of families find high-quality senior care. To speak with one of our Family Advisors about assisted living options and costs in Abingdon, call (855) 863-8283. Abingdon, Virginia is a vibrant mixture of art and nature. Nature lovers get a great view of the Blue Ridge Mountains, along with a myriad of rivers and lakes. Theater lovers can enjoy a trip to the famous Barter Theater, where famous actor Gregory Peck once performed. Seniors may also be excited to learn that there are 18 assisted living facilities in the area, with five in Abington itself and the rest in neighboring towns. In Virginia, these facilities are regulated by the state's Department of Social Services. The cost of living in Abingdon is 15 percent lower than the average for Virginia and 8 percent lower than the national average. Seniors may find that the costs of goods and services here are lower than in other cities. The crime rate in Abingdon is 17 percent lower than the national average. It is said to be safer than 55 percent of U.S. cities, so seniors may feel more secure in their residences here. The Abingdon area is home to world-class medical facilities, including the Johnston Memorial Hospital, in the event of medical emergencies or illness. The weather in Abingdon could be problematic for seniors who enjoy spending time outdoors. While daily highs normally stay between 50 and 80 degrees (depending on the time of year), Abingdon receives a lot of precipitation. August alone sees over nine inches of rain on average. The air quality in Abingdon is 9 percent better than the national average. The pollution index is better as well, with Abingdon having lower pollution than 78 percent of the country. This is great news for seniors with respiratory concerns. Virginia's District Three Governmental Cooperative gives seniors in Abingdon both free and low-cost transportation services, so seniors don't have to worry about how they will get from one place to another. Assisted Living costs in Abingdon start around $3,522 per month on average, while the nationwide average cost of assisted living is $4,000 per month, according to the latest figures from Genworth’s Cost of Care Survey. It’s important to note that assisted living rates in Abingdon and the surrounding suburbs can vary widely based on factors such as location, the level of care needed, apartment size and the types of amenities offered at each community. 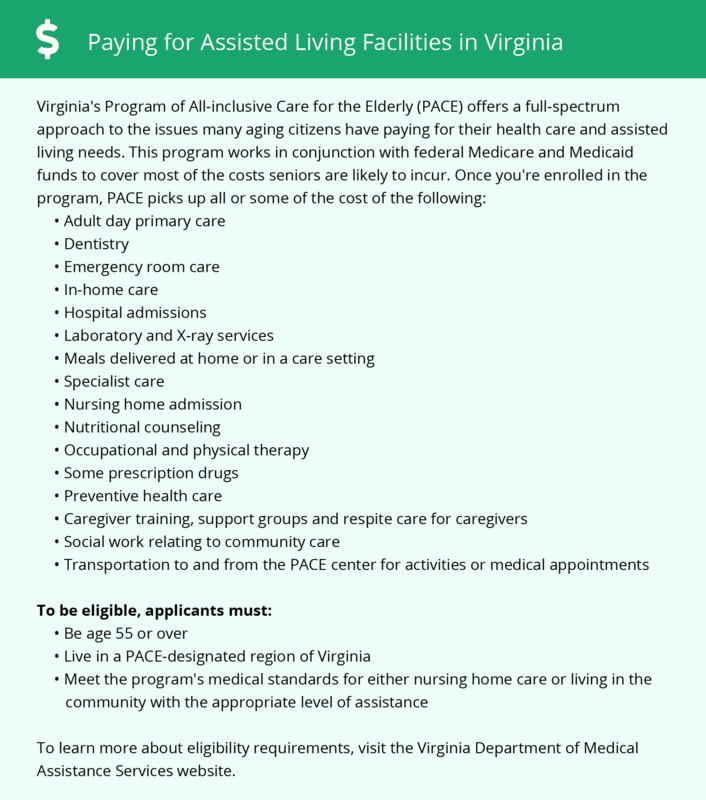 Eligible seniors in Abingdon can apply for financial assistance for assisted living through the Auxilary Grant and state supplement to SSI. Abingdon and the surrounding area are home to numerous government agencies and non-profit organizations offering help for seniors searching for or currently residing in an assisted living community. These organizations can also provide assistance in a number of other eldercare services such as geriatric care management, elder law advice, estate planning, finding home care and health and wellness programs. To see a list of free assisted living resources in Abingdon, please visit our Assisted Living in Virginia page. Abingdon-area assisted living communities must adhere to the comprehensive set of state laws and regulations that all assisted living communities in Virginia are required to follow. Visit our Assisted Living in Virginia page for more information about these laws.